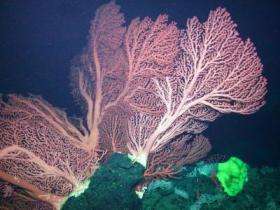 Over the last two decades, marine biologists have discovered lush forests of deep-sea corals and sponges growing on seamounts (underwater mountains) offshore of the California coast. It has generally been assumed that many of these animals live only on seamounts, and are found nowhere else. However, two new research papers show that most seamount animals can also be found in other deep-sea areas. Seamounts, however, do support particularly large, dense clusters of these animals. These findings may help coastal managers protect seamounts from damage by human activities. Tens of thousands of seamounts dot the world's ocean basins. Although some shallower seamounts have been used as fishing grounds, few seamounts have been studied in detail. Davidson Seamount, about 120 kilometers (75 miles) offshore of the Big Sur coast, is an exception. Since 2000, researchers have spent over 200 hours exploring its slopes and peaks using the remotely operated vehicle (ROV) Tiburon. Two of the expeditions to Davidson Seamount were led by Andrew DeVogelaere of the Monterey Bay National Marine Sanctuary and were funded by the National Oceanic and Atmospheric Administration's Office of Exploration. Other expeditions were funded by the David and Lucile Packard Foundation (through MBARI) and were led by MBARI biologist James Barry, who studies seafloor animals, and by geologist David Clague, who studies undersea volcanoes. Following each expedition to Davidson Seamount, marine biologists at MBARI studied high-resolution video taken by the ROV and identified every animal they could see. Over 60,000 of these observations were entered in MBARI's video annotation and reference system (VARS). Craig McClain and Lonny Lundsten, the lead authors of the two recent papers, used the VARS database to find out which animals were unique to Davidson Seamount and which had been seen elsewhere. Altogether, 168 different species of animals were observed on Davidson Seamount. McClain's search of the VARS database showed that 88% of these animals had also been seen or reported in other deep seafloor areas, such as the walls of Monterey Canyon. Three quarters of the species on Davidson were not even unique to the California coast, and had been seen in seafloor areas over 1000 kilometers (620 miles) away, including the Hawaiian Islands, the Sea of Japan, and Antarctica. Only about seven percent of the species at Davidson Seamount had never been seen anywhere else. Of these 12 apparently "endemic" species, most were new to science. Thus, their full ranges are still unknown. Although few animals are "endemic" to Davidson Seamount, the research demonstrated that this seamount does support distinctive groups of animals, which are dominated by extensive "forests" of large, "old-growth" corals and sponges. These same species of corals and sponges also grow on the walls of Monterey Canyon, but usually as smaller, scattered individuals. Conversely, sea cucumbers are common on the walls of Monterey Canyon, but are rare at Davidson Seamount. Thus, animals that are common on Davidson Seamount are uncommon in other seafloor areas, and vice versa. The researchers speculate that Davidson Seamount is a good habitat for deep-sea corals and sponges because it has favorable bottom materials (bare lava rock), a steady food supply (drifting particles of the right size and type), and may be less disturbed by strong bottom currents than other seafloor areas. Craig McClain, one of the lead authors, explains, "The large groves of corals and sponges are unique to seamounts. The crests of seamounts are particularly good because they provide flat rocky surfaces that don't accumulate much sediment. This is partly due to the fact that seamounts are so far offshore." In contrast, McClain points out, "When you look at the seafloor in Monterey Canyon, it's mucky. That makes it tough for filter feeders, especially sponges. Any flat surface in the canyon collects mud. This makes it tough for corals to settle anywhere except on near-vertical surfaces. Just staying attached to these surfaces can be a challenge in itself." McClain and Lundsten's research also suggests that seamounts such as Davidson Seamount may be ecologically important as breeding grounds for animals that are rare in other habitats. As McClain writes in his paper, "seamounts are likely to be sources of larvae that maintain populations of certain species in sub-optimal, non-seamount sinks." He explains, "Sources are places where certain species do really well—they're self sustaining populations. Sinks are areas where these species can live, but do very poorly. Populations in sink areas will die out if they're not continuously replenished by new animals from source areas." The researchers suggest that future DNA studies of seamount animals would help scientists find out if seamounts are indeed sources of larvae for other seafloor areas. Lundsten's paper emphasizes the fact that not all seamounts are alike. For example, Rodriguez Seamount, a smaller seamount offshore of Point Conception, once extended above sea level. Thus, Rodriguez Seamount has a flat, sediment-covered crest that is partially covered with ancient beach sands. These sands have been colonized by a very different set of animals from those at Davidson Seamount. In fact, sea cucumbers are the most abundant animals on Rodriguez Seamount. In 2008, Davidson Seamount was added to the Monterey Bay National Marine Sanctuary. Findings from McClain's and Lundsten's papers will provide critical information for managing Davidson Seamount, and could be useful in other sea-life protection efforts around the world. Prior to this study, seamounts were considered isolated biological "islands," which might require management to protect certain unique species. This study, on the other hand, suggests that seamounts should be managed as entire communities, whose dense populations of animals release larvae that help colonize other, less optimum environments. Either way, the authors point out, seamounts are well worthy of our protection.